The state comptroller and a top labor leader said Thursday that Gov. Rauner was potentially squandering “hundreds of millions of dollars” by not paying contractual raises to state union workers. 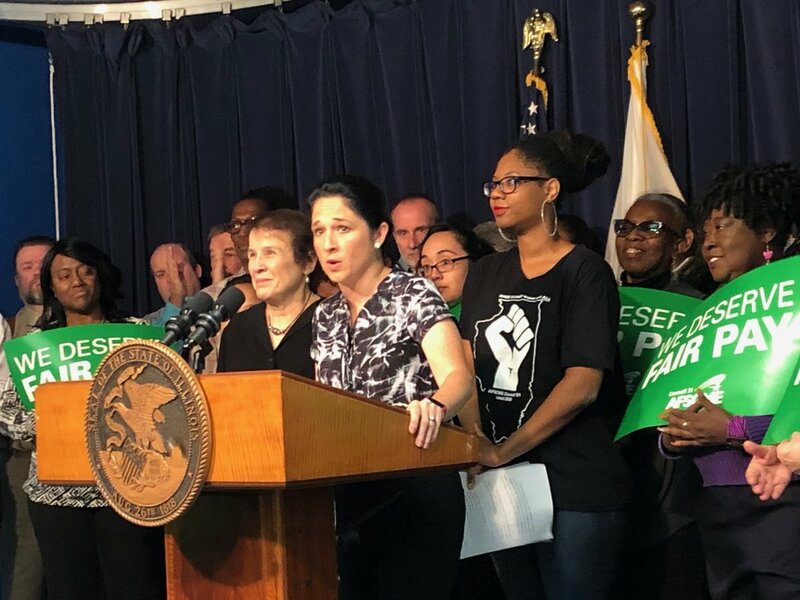 In a news conference at the Thompson Center in Chicago, Comptroller Susana Mendoza and Roberta Lynch, executive director of the local American Federation of State, County and Municipal Employees, said Rauner had ignored an Oct. 1 deadline to implement so-called step increases for more than 20,000 state workers, as called for in their last contract. 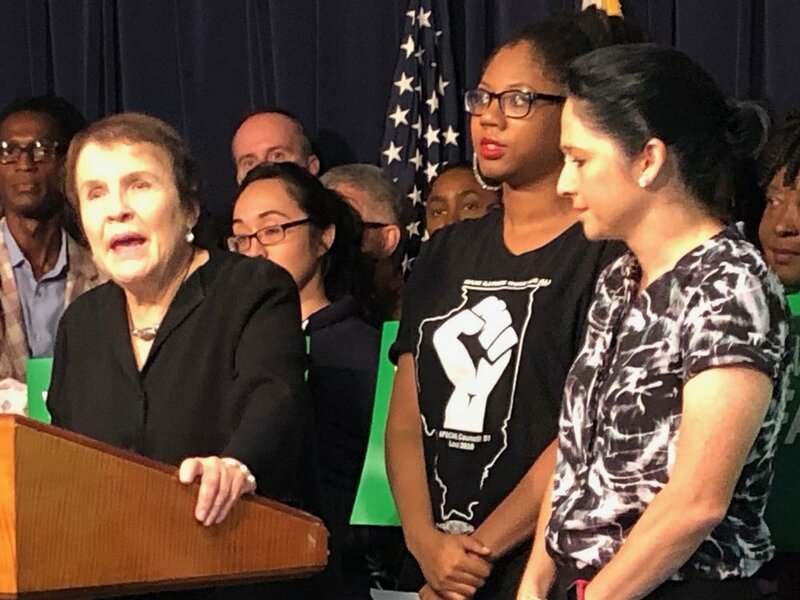 According to Lynch, Rauner unilaterally declared an impasse in negotiations with AFSCME Council 31 at the beginning of 2016 after freezing step increases for the newly employed the previous summer in his first year in office. That was affecting public-service workers, Department of Human Services caseworkers, correctional officers, and environmental workers, many of them fresh out of college and working their first jobs. Lynch said the 20,000 most recent state hires make up about 40 percent of the state workforce, and “they tend to be the youngest and often the lowest-paid” workers. Lynch said the union had fought the declared impasse and won the last decision a year ago in appellate court. Although the case remains under appeal, the state Supreme Court declined to hear it this spring and sent it back to the Illinois Labor Relations Board, which set an Oct. 1 deadline for compliance. Mendoza pointed out the state was on the hook for back pay on those wage increases dating back more than three years, and that it was subject to 7 percent interest. She threatened a “crisis of payment” potentially amounting to “hundreds of millions of dollars” if the state were suddenly compelled to settle the back pay. “They’re not asking for anything they’re not owed,” Mendoza pointed out. Brittany Adams, a caseworker with the Department of Human Services, said she’d received a 2 percent pay raise over the five years she’s worked the job since graduating as a psychology major at the University of Chicago. She said that had not kept pace with the cost of living, and that she had had to defer payment on student loans, and she wasn’t alone in that plight. A Rauner spokeswoman replied Thursday that any owed salary increases would be paid once the issues are resolved. “Despite the rhetoric at today’s press conference, this isn’t a matter of if step increases are going to be paid, but how and when,” said Elizabeth Tomev. She insisted, “The ILRB compliance officer did not order the state to pay employees' step increases by Oct. 1. The state was ordered to provide 16 categories of ‘information’ relevant to determine what employees were owed by Oct. 1. Lynch and Mendoza charged that it was all part of Rauner’s anti-union agenda. Calling the governor “hopelessly out of touch,” Lynch said, “He cannot tolerate when working people come together and stand together in order to say they deserve a decent standard of living. Lynch said they’d press the issue, and she called on the ILRB to ask the appellate court to compel compliance. Rauner, of course, originated the lawsuit that eventually became Janus v. AFSCME Council 31, with the U.S. Supreme Court issuing a ruling in June that struck down so-called fair share union fees and imposed what some have called “right-to-work” rules for government employees. Mendoza was even more critical of the governor.